Bosnia Begins Work On First Census Since Its Bloody Civil War : The Two-Way Before the former Yugoslavia split and battles began in 1992, Bosnia had about 4.4 million people. It's likely fewer than 4 million are there now. An accurate count is needed if the nation is going to one day join the European Union. 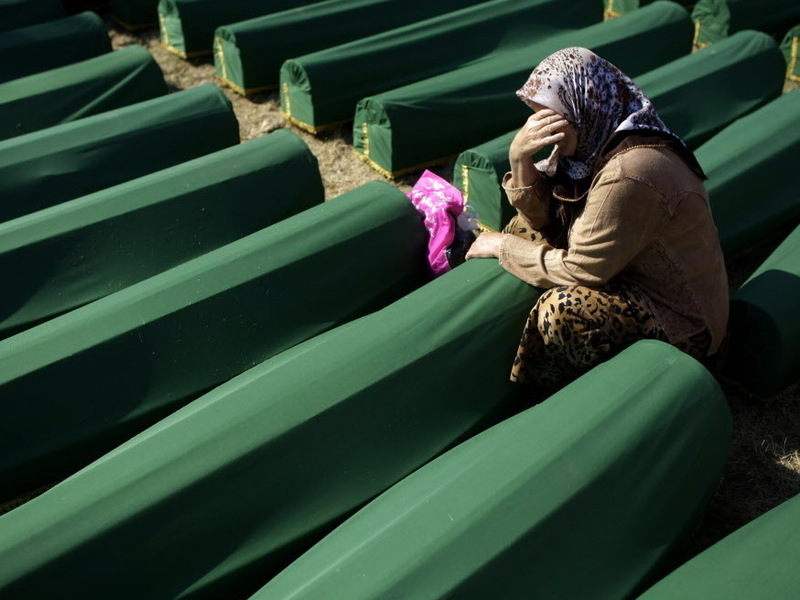 July 11, 2012: A woman cried next to the coffin of her relative at the Potocari memorial complex near Srebrenica. More than 8,000 Muslim men and boys were executed there in July 1995. It was the worst massacre in Europe since World War II. Population censuses aren't normally something to get excited over. But for Bosnia, a nation that hasn't counted its own people in over two decades and has its eye on becoming part of the European Union, even a pilot census is of great importance. No formal national count has taken place since before the breakup of Yugoslavia, and the subsequent ethnic conflict that shocked the world. Today, Bosnia began a two-week test census, targeting around 15,000 people, in order to gauge how prepared it is for an official, nation-wide census in the spring of 2013. Before the three-year civil war, which began in 1992, around 4.4 million people inhabited what now makes up Bosnia. By 1995, nearly half had lost their homes and more than 100,000 had lost their lives. Now, Bosnia's effort to count its people is a not-too distant reminder of the nation's embattled past. The International Organization for Migration (IOM) estimated Bosnia's population to be around 3.8 million last year. Thousands of Bosnian refugees have yet to return. "We didn't have a census for 20 years," Zdenko Milinovic, director of the Bosnian Statistics Agency, told the BBC, "so we don't have an opportunity, like other countries in the region and EU, to compare it with past results and fix mistakes." In order for Bosnia to join the EU, up to date demographic information is required. While the Balkan state seems to be making crucial steps, this month's closure of its National Museum over a failure to agree on funding offers a reminder of the long-standing political divides and internal strife still plaguing Bosnians, Croats, and Serbs long after the war's end.